Enable More GoodEMG Group is a specialist advisory firm for Corporate Social Responsibility (CSR) and strategic sustainability. Founded in the Netherlands in 2004, the award-winning advisory firm has been the first choice in Sustainability and CSR advisory for governments, businesses and not-for-profit organizations worldwide. Unique in EMG’s methodology is its positive, integrated, and strategic approach to Sustainability and CSR, coupling Sustainable Development with organizational objectives of economic, social and environmental prosperity and growth. For a complete overview of our services, please click here. Over the years, EMG has become a recognized authority in its field. The winner of numerous international awards for its quality service and generated impact, EMG is regularly invited as a keynote speaker and international expert to share its thoughts and opinions on the most important trends in CSR and Sustainability. 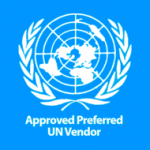 EMG is a approved and registered vendor to the UNGM with a highest level registration. Through our core team of senior advisors and expert consultants, strengthened by our diverse international network of sustainability management specialists, we enable organizations to gain access to the very best minds in the field.